Divine Pumpkin Roll Recipe | mrs. and the misc. I have teamed up with some fellow bloggers and today we are ALL writing a Collectively Creative: Halloween Edition post! Be sure to check the bottom of this post for links to all the other fabulous blogs 🙂 There are some fantastic ideas! 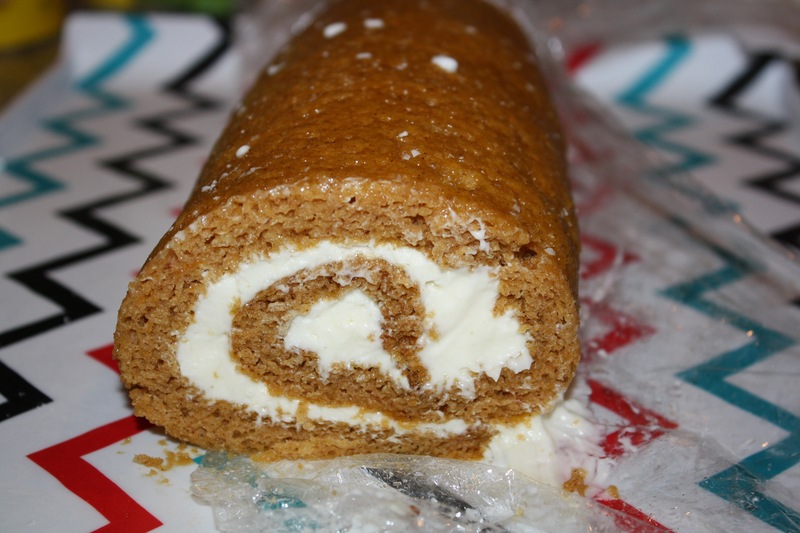 Now back to my Divine Pumpkin Roll recipe…is your mouth watering yet?!?! I am the first to admit I am NOT a baker. I usually do things wrong and whatever I’m making ends up tasting gross. This recipe actually made me feel like I can actually conquer baking! It was actually easy and tasted YUMMY! My husband loved it and so did his cousin Ricky and his wife! 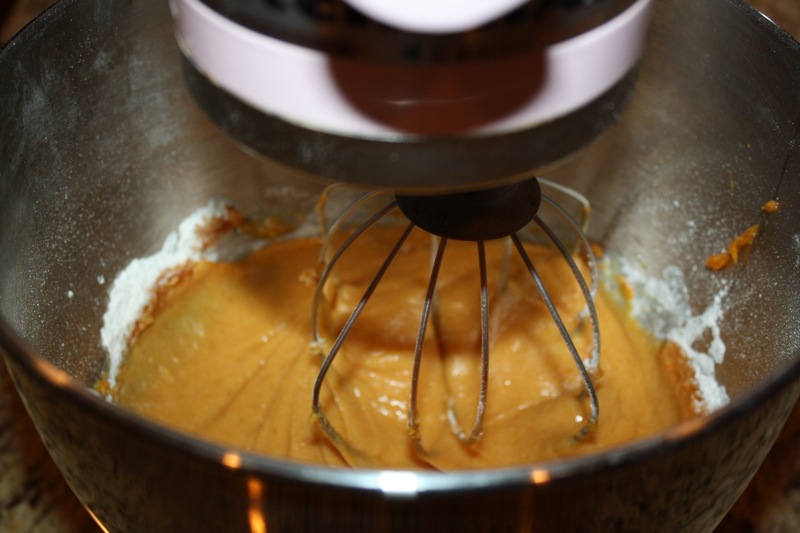 I promise if you even remotely like pumpkin, you will LOVE this recipe! Preheat the oven to 350 degrees. Grease a 15 X 10-inch jelly roll pan. 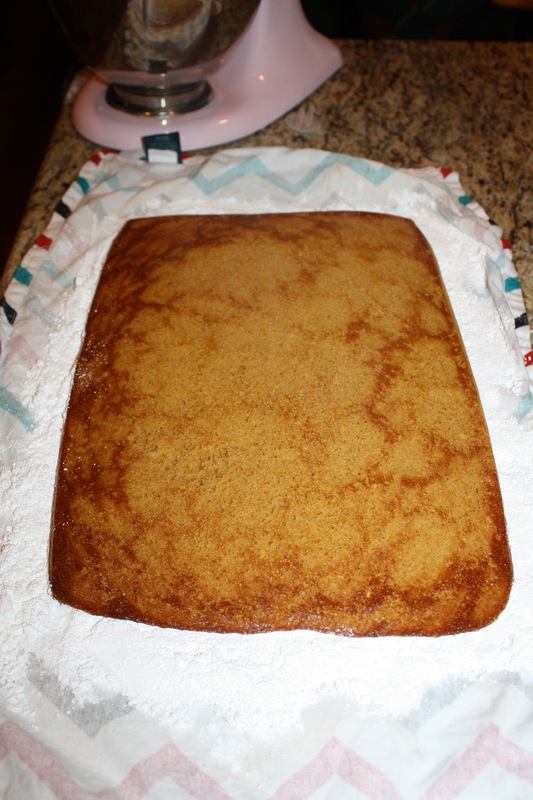 Cut wax paper to fit the bottom of the pan and leave an inch overhang on each of the short ends of the pan. Lightly grease the wax paper and sides of the jelly roll pan. 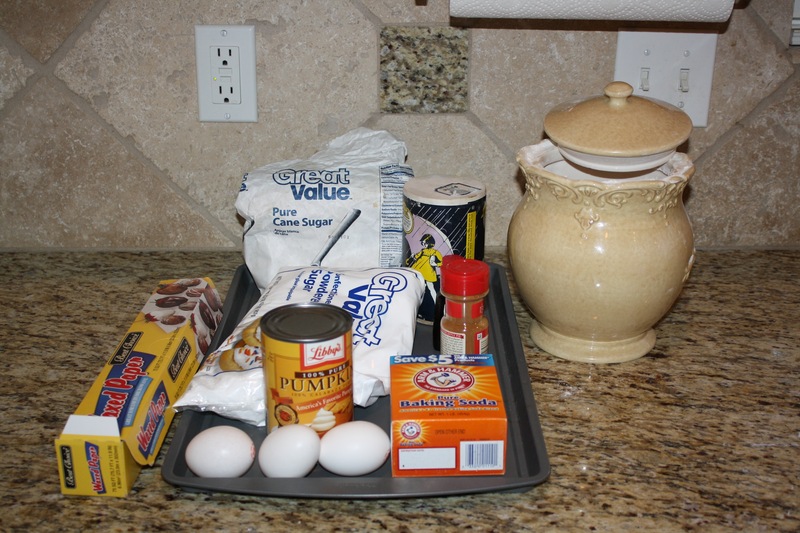 Mix the sugar, flour, salt, soda, cinnamon, eggs and pumpkin in a large bowl. Once mixed, pour mixture over the waxed paper. Sprinkle the walnuts, if using, on top of the mixture. Bake for 14-15 minutes until edges pull away from the sides of the pan and center is done. Lay a large dishtowel on the counter top (it is best to use a dishtowel without any texture or a tea towel works best). 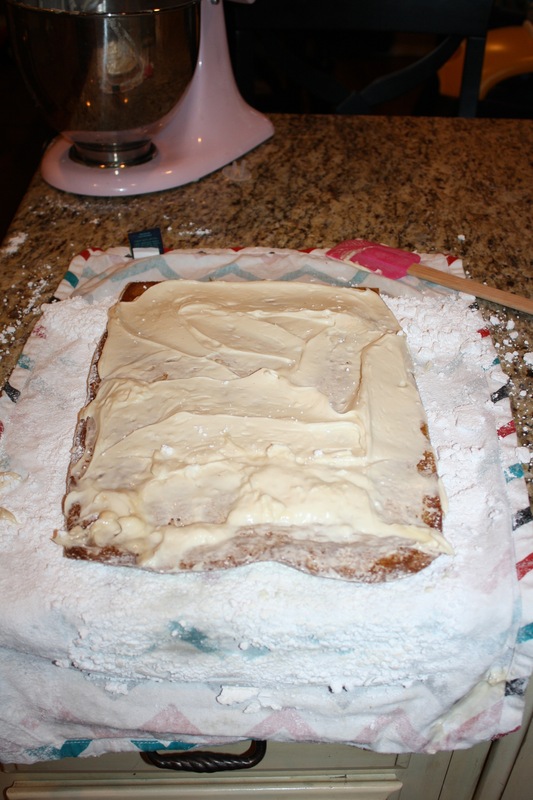 Spread a thick dusting of powdered sugar all over the towel. 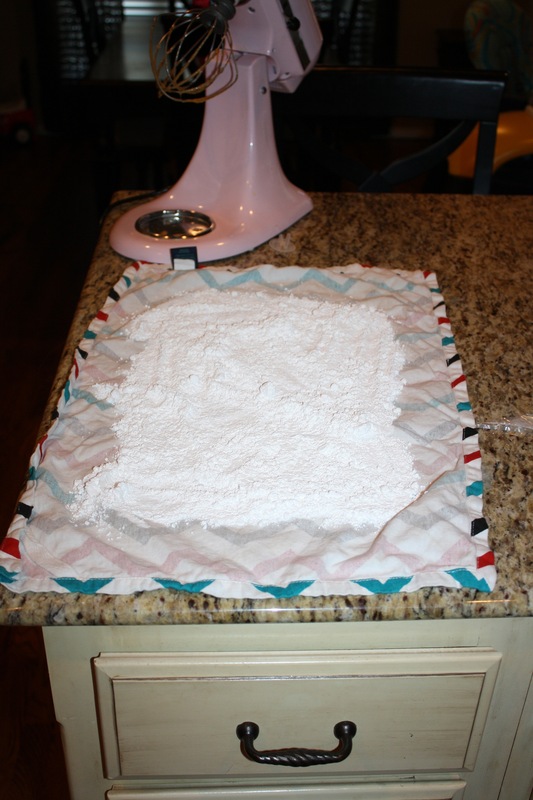 When the cake comes out of the oven, turn the pan upside down on the powdered sugar-laden towel so the wax paper is on the top. 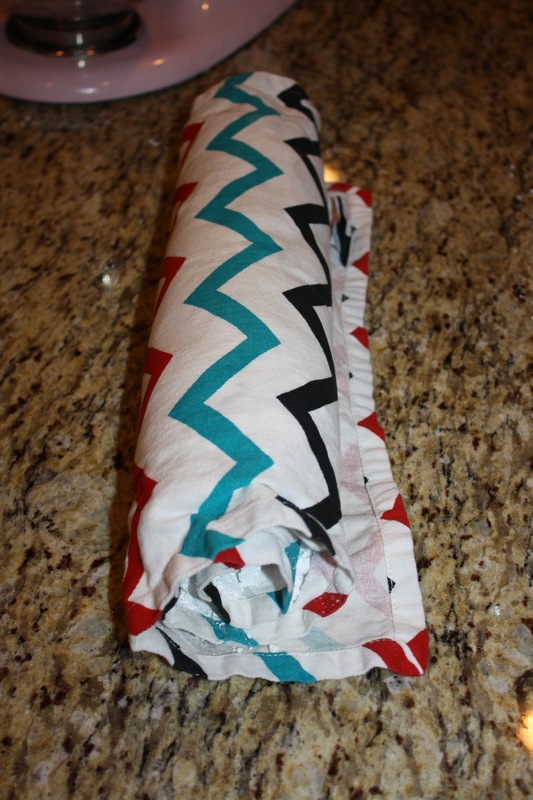 Gently peel off the wax paper, being careful not to tear the roll. Starting at one of the short ends, roll the pumpkin cake up with the towel to cool. 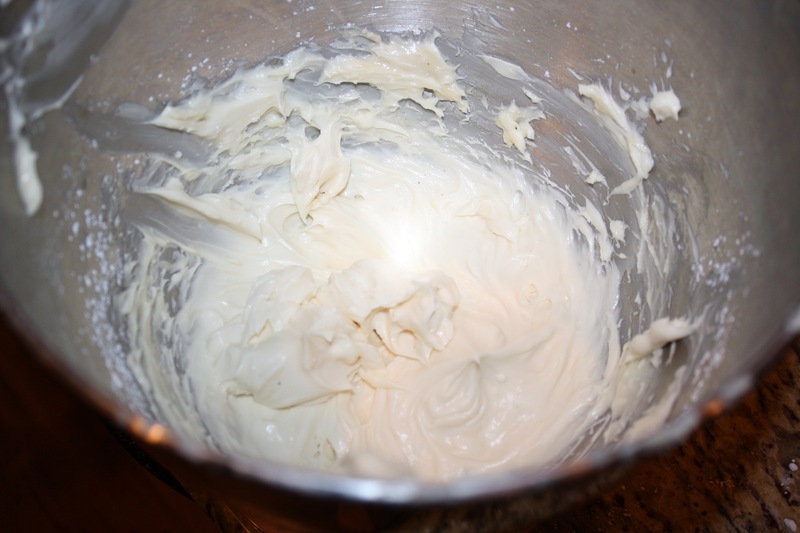 While the roll is cooling, mix the cream cheese, butter, vanilla, and powdered sugar together until it is light and creamy. Once the roll is cool, unroll and with an offset spatula, carefully spread filling in an even layer over the cake. Roll it up without the towel and place in the refrigerator (covered with plastic wrap or wax paper) for about an hour before serving. I hope you enjoy it as much as I do! Dig in! Before you go, be sure to visit the blogs below for more Collectively Creative: Halloween Edition posts! This looks great. I bet my husband would love this too! Mmmmm I can just imagine that with some chai tea or warm coffee on a Fall afternoon! Looks delicious! Yes it’s simply delicious and easy to make! It was as good as it looks!! I love pumpkin rolls (or pretty much anything with pumpkin) and this looks amazing! Oooo, I’m so glad you shared this! I’ve never tried to make a pumpkin roll (or any kind of roll before) but my boyfriend would absolutely love this. Pingback: Introducing Mrs. Aubri Duran to Mrs. & the Misc. | mrs. & the misc.